As we are all trying to get back into a routine of early mornings, busy getting our kids to all the extra activities after school, finding time for homework and dinner. This time of year can have a huge impact on all of us, more energy is required, and our kids need more attention and reassurance. 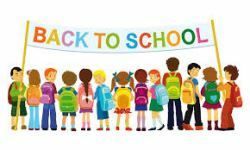 We are all readjusting to the new school year, whether it is the first day of school, starting secondary school or the added pressure of an exam year. Our health can be affected in many ways. The immune system can become depleted leading to more infections, picking up any viruses at school, coughs, colds, tummy bugs and loads more. Some children can find it hard to separate from Mum in the mornings, others have poor concentration, anxiety or even depression. If there is already a condition present for example asthma, attacks or episodes of breathlessness can become more frequent either due to anxiety, change in temperature or environments influences like having to be in a classroom, different smells etc. What is Homeopathy and how can Homeopathy help? Homeopathy is a holistic medicine meaning it treats the whole person not just the symptoms of the condition. It is safe, effective and a gentle form of treatment. Homeopathy uses remedies which are made from naturally occurring substances like plants, flowers and minerals. Homeopathy is effective in treating physical, mental and emotional conditions. It strengthens the immune system, it stimulates the body’s ability to fight infection and susceptibility to disease. Homeopathic remedies are cost effective, they are cheaper than conventional medicines and have no side effects. Homeopathy can treat acute conditions for example, falls, bruises, tummy bugs, head lice, threadworms, colds, coughs, period pain and you can get these remedies in the health food shops. But if the complaints are more chronic and there is recurrent infections where frequent antibiotics are required, constipation, bed wetting, impetigo, insomnia, behavioural difficulties the child will need constitutional treatment where a homeopathic consultation is needed. In general we recover from these easily enough with rest and nutritious food, homeopathy offers some useful remedies to speed up the process..
Give one dose at the first sign of inflammation. Frequent, painful sneezing with burning, watery nasal discharge which makes the top lip sore, stuffed up at night, very chilly, restless and anxious. Sudden, violent onset. Colds that start as a result of getting chilled, particularly in cold wet weather. Redness, heat, rawness of throat and nose. Violent headaches. Colds that go the chest quickly, nose red and shiny, thirsty for cold drinks with a bloody mucous discharge. Yellow mucus which clogs up indoors, congestion of the head, lips chap and peel. Patient is thirst less, weepy, loses appetite and wants sympathy. Very painful cough where patient holds his chest when coughing, worse for deep breathing. Patient wants to be left alone and is grumpy. Great remedy for pleurisy and pneumonia. Loose cough with lots of rattling in chest and difficulty raising mucus. Recurrent bronchitis. Worse for cold and drafts. Dry, hard cough. Chest is very tight, cough worse for talking, laughing and going form warm to cold air. Dry cough, worse in the evening and lying down in a warm room. Patient needs to sit up when coughing, wants fresh air. Severe diarrhoea with vomiting. Painful stomach cramps with stools that are smelly and burn the skin. Great anxiety and restlessness. Stomach upset with diarrhoea from excess food for example following a birthday party. Irritable and impatient. Arnica should always be given first, remember DO NOT PUT ARNICA CREAM ON AN OPEN WOUND!!! Injuries to muscles and following overexertion of them. Injuries to nerve rich areas, fingers, toes, teeth, coccyx. Injuries to ligaments and tendons. Fear and apprehension before an ordeal. Stage fright, exam nerves, public speaking or sudden panic in a crowd or closed spaces. Diarrhoea can accompany the anxiety with trembling of limbs. Sudden fear with restlessness and irritablility. Usually worse at night unable to sleep or wakes during the night and desires company. Paralysed with fear before an ordeal. Exam nerves, fearful of public speaking with trembling. The mind and body seizes up where the person forgets their lines or school work. Seperation anxiety where the child is clinging on to Mum, very shy, sensitive and tearful with a fear of being abandoned. Very common during the school year. Instead of reaching for an insecticide treatment, it is important to understand the life cycle of the head lice. They lay their eggs which hatch every 3 days so if you use a hair conditioner and comb the hair for 3 days in a row, the life cycle will be broken. If symptoms are persistent Staphysagria will help to reduce the susceptibility to the head lice. Childhood illnesses, recurrent infection, glandular fever, behavioural difficulties; Autism, Aspergers syndrome. Skin conditions, eczema, psoriasis, acne allergic reactions. Gastric upsets, stomach ulcers, indigestion. Puberty, period pains, pre menstrual tension. Depression, anxiety, panic attacks, suicidal thoughts. Shock, post traumatic disorder, insomnia.